for only one season. Throughout the 1980s and most of the 1990s Lucas worked mainly as a producer. Movies such as Howard the Duck (1986) and Radioland Murders (1994) were failures; others, such as Tucker: The Man and His Dream (1988) and Willow (1988), were more successful. Champlin, Charles. George Lucas: The Creative Impulse. New York: H. N. Abrams, 1992. Rau, Dana Meachen, and Christopher Rau. 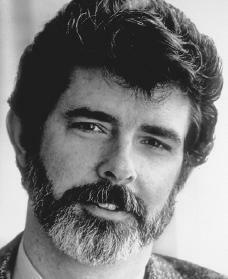 George Lucas: Creator of Star Wars. New York: Franklin Watts, 1999. Riehecky, Janet. George Lucas: An Unauthorized Biography. Chicago: Heinemann Library, 2001. White, Dana. George Lucas. Minneapolis: Lerner Publications, 2000. Woog, Adam. George Lucas. San Diego: Lucent Books, 2000. This is very accurate, although never mentioned the creations The Last Jedi (IX), Rouge One (Star Wars Story), Solo (Star Wars Story), and Revenge of the Sith (III). Still, very impressive!